One of the new items is the spring clean of this newsletter webpage .... the layout has been changed and the code tidied up .... it should now load faster and be read more easily by screen readers for those who are visually impaired. A further experiment is with machine translation of this page into other languages, see the links at the top of the page. each programme is between 20 and 30 minutes long. Focus is "Information Literacy Across the IB Programmes"
There are 26 different school IB websites listed in this area on Shambles ... it would be appreciated if you also have a page on your school website dedicated to IB then could you add it to the list using the form at the bottom of the page. This section is intended to focus mainly on Mandarin but as this is a subsection of Modern Foreign Languages then there might be some slippage in wider mfl. Not only for languages teachers but also mathematics .... how about looking at some websites that support counting in different languages ... for a cross curriculum opportunity. Don't miss the links here for counting in Thai and Chinese, suitable for all ages. 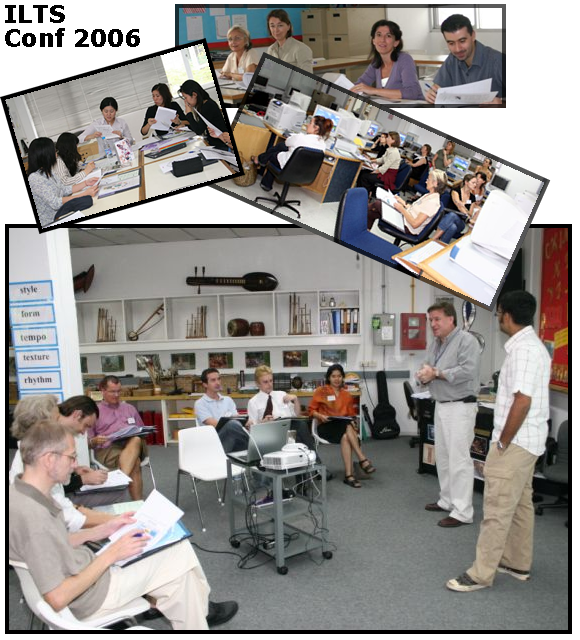 Chalk and Cheese .... opportunities for our own continuing professional development (CPD) ten years ago were mainly limited to expensive (in time and money) face to face sessions, meetings, courses and conferences both in and outside of the school. Now we are inundated with online and collaborative opportunities ... in fact so many that the number of choices can be demotivational and daunting ... that's providing we have overcome technical difficulties or learnt new software. Many of these opportunities have links scattered around the different areas on Shambles ..... but for your viewing today ... how about these two? See Edward de Bono give a presentation on "Thinking"
'website', 'simple', 'free', collaborative, 'sharing', 'fun', 'functional', 'RSS', 'tags', ... all are terms that can be used to describe the new (actually not so new anymore) Web 2.0 environment .... and a page of Web 2.0 information related to teaching and learning can be seen on Shambles . In this CNN story they identify 25 companies, in five Next Net categories, whose approaches help illuminate where the Web is headed and where the opportunities lie. "Most are startups, a lot of them with less than 10 full-time employees. Few are currently making money, and it's a given that many will fail. But it's equally likely that somewhere within this group lurks the next Google or Microsoft or Yahoo -- or at least something that those giants will soon pay a pretty penny to have." World Cat search is now an option on the Shambles Librarians page. Ask.com has added support for ISBN number searches. Brilliant concept for a search engine .. try it .. you'll smile! "Outside of a dog, a book is man's best friend. Inside a dog, it's too dark to read". Singapore American School (SAS) and United World College of South East Asia are also hosting The Singapore International School Mathematics Competition (SISMC). "Last year was our first and we hope to continue each year. It will take place on 11 Nov. 2006 at SAS and be a 1-day event. Last year we had 8 Singapore schools compete. The format is similar to SEAMC, but using a shortened schedule. Created to support the professional development of teachers of maths at every level, the site will allow teachers to share best practice, download free teaching resources, join discussion forums, access CPD opportunities and more. I'm such a fan of Google that this is going to be a regular section in future newsletters .... and its not just because it's a brilliant search engine .... in fact it's not a search engine at all, it's really an advertising company anyway .... but it is because of all the other toys that come out of Google Labs and out of the minds of the founders ..... for free. Google and teachers have a similar objective: to help people build knowledge by providing greater access to useful information. Google recognizes the central role teachers play in breaking down the barriers between people and information, and they support educators who work each day to empower their students and expand the frontiers of human knowledge. The Google Teachers' Newsletter is one of the ways they are working to bolster that support and explore how Google and educators can work together. Get your campus talking ... "Schools accepted by Google during the Google Apps for Your Domain beta period are eligible for free service for their approved beta users even beyond the end of the beta period, as described in the Terms of Service." Google label (tag) ALL the images in their database using a game .... very clever. from TED Conferences .. a new one released each month. Each is about 20-30 minutes long and are VERY professional .... excellent for continuing professional development .... or just to stimulate your mind. Guaranteed to be engaging ! ... but they are addictive. Surprisingly not many schools have taken up the advertising options on 'Shambles' : we get over 10,000 visitors and over 20,000 page impressions each day during term time. Don't ask ... just look at the 9 minute online video ... you can afford the time! Microsoft are to discontinue their Class Server VLE product in January 2007 the replacement is the Sharepoint Learning Kit (SLK). Class server content will continue to run on SLK. SLK will be covered by the Microsoft Community License (Ms-CL) and available at no cost. If yes then just send me an email with your first name / last name / and the username you would like and I shall create it for you. The actual email engine being used for this is Google's gmail .. so very reliable, confidential and trustworthy. After I've created the account for you then just log in at http://mail.google.com/hosted/internationalteacher.info to send and read email .... this is open to the first 80 that ask .... ONLY for teachers in international schools. ECIS and University of Cambridge International Examinations (CIE) have agreed to work together on the development of an ECIS International Teaching Certificate (ITC). ECIS will be responsible for the professional development program, CIE the external assessment of teacher portfolios. Shambles Poster for Staffroom Noticeboards : Full of I.T. It would be appreciated if you could download and print out this A4 notice for your staffroom noticeboard. in Thailand ... now in its tenth year. ..... hope you all have a great time. I don't have time for work"
If you know of any commercial companies or organisations that might be interested in sponsoring a future newsletter then please feel free to forward this newsletter to them .... many thanks.